As one of the active wings of the Salesian presence at Bethlehem, the Salesian Scout functions as a forum of youth, basing itself on the value systems proposed by St. John Bosco and Robert Baden Powell. From its inception in 1922 till today the Salesian Scout unceasingly keeps itself busy with various activities contributing to human growth and social development. It holds the distinction as the sixth scout in the whole of Palestine. The growth of the Scout stands witness to the success of the system; there are nearly 120 scout members, ranging from 6 to 45 years, form a part of this great movement – a honey comb – which is the spring board of many good works. Members of the Scout would definitely witness to the ‘sense of belonging’ that they feel being part of this organization. 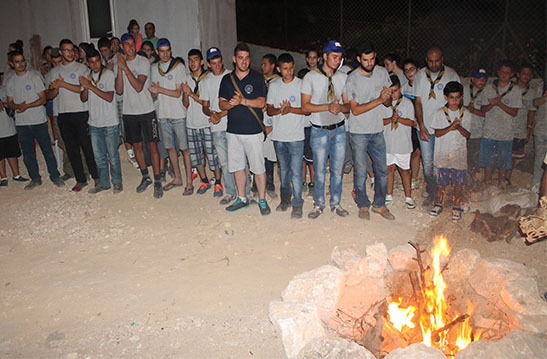 The Salesian Scout is known for its collaboration with the other Scout groups all around Palestine. Trained by the Salesians of the yester years, the Scout is exuberant about its social activities. Visiting the old age home, cleaning the campus, regular training in music – band instruments, exhibition of their musical skills in the yearly parade at Bethlehem, organizing prayers services, spiritual processions in the locality especially on the feast of the Sacred Heart in June, conducting summer camps, and through various other activities the Scout members exhibit their leadership qualities par excellence. As a disciplined unit it imparts the values of St. John Bosco to its new members. Thanks to the Salesians and the lay staff for the availability and their constant nurturing. Staying true to the adage of St. John Bosco, being ‘Good Christians and honest citizens,’ the Scout aims to learn always, through collaboration with other groups and movements. Apart from the perennial learning experience from outside, the Scout is also auto-didactic. Being a nexus of every groups and movement at the Salesian convent, the Scout stands in need of every kind of assistance, in particular monetary assistance.